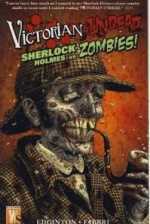 Victorian Undead Sherlock Holmes vs Zombies! London is hit with a mysterious plague that creates legions of the Undead. Only Sherlock Holmes, with the help of Dr. Watson and his brother Mycroft can possibly save the city (and maybe even the world) from being overrun. But zombies are mindless, and these zombies get their marching orders from a man whom not even death can destroy. It's life versus death in a struggle that might just very well become eternal as Sherlock Holmes battles Zombies! I have to admit, it's one heck of a hook: Sherlock Holmes, a character almost as deeply rooted for me as Spider-Man, battling zombies, which, while certainly overused, are still fun to read about, at least in my opinion. The problem here is that Edginton, like so many before him, faily to grasp that the key to Sherlock Holmes is his mind, not his fists. Think about this for a second: The smartest man in all of London is threatened with being a slobbering, mindless ghoul. The prospect should horrify him, yet it's never mentioned. Not once. That's a gold mind of an idea and Edginton, frankly, blows it. He even gets a great chance to have Holmes receive the ultimate humiliation at an old foe's hands, and he blows that, too. That's the problem with so many modern takes on Holmes. Writers want to make him an action hero, and he's not. He's the prototypical detective, the main brain. He's a walking CSI. Making him run around and, God help us here, using the bludgeon of fire to solve the problem is just wasting the man's fictional talents. Worse, he's frequently about to die with only Mycroft to save him. How is that possible, over and over again? This Holmes is brave, but he's also incredibly stupid. While we do see a bit of detecting here and there, I'd love to see Holmes fix the zombie problem with his brain. That's what makes him Holmes, and not just a time-travelling Ash. Edginton might as well have given him a chainsaw instead of a borrowed pistol. Artistically, this isn't bad. Fabbri amps up the gore when it's necessary, but there's nothing in here that I think is gore for gore's sake, which can happen in any horror comic, but particularly in ones that feature zombies. His characters are a bit stiff, but the facial expressions are pretty good. I can tell when a person is scared, angry, horrified, and what have you easily enough. The problem is more in the stiff staging of characters. I don't know if that was intentional because of the time period or not, but I felt like I was reading sample pages of how not to pose characters at times. I know Holmes can often be played as stiff in television, but I don't think that works in a comic book. The biggest problem Fabbri has is that he's not Tom Mandrake, who knocks his cameo art appearance out of the park. Channeling the late Gene Colan, Mandrake draws the heck out of a familiar scene in Holmes lore, making even a brutal lolling eyeball look crafted with precision. Never, ever ask a better artist in your comic. It's a bad idea. Ultimately, however, I just can't get past the miscasting of Holmes in this one. The story is perfectly fine, but it doesn't need Holmes, much as the Downey Jr. movie didn't need him, either. I quipped then that Monsieur Le Bow Tie would have made a much better protagonist in that movie, and the same is true here. A completely new action figure with a few Holmes-like traits would have fit the bill here and left me greatly entertained. There's only one problem: Adding Holmes gooses sales, whether it's butts in the movie theatre or hands for the comic. It's a shame, but it's true. As it stands, however, this one ultimately fails because its hero is so far out of place, either intentionally or because Edginton just doesn't understand the essence of the character. I liked this book well enough, but nothing in it stands out enough to recommend it from the other zombie fare out there. The name factor can only carry it so far, and in this case, the goosing is just not enough. I'm going to have to keep looking for my Holmes fix, it seems. Maybe someone soon will get it right, before I myself am ready to turn into a zombie!